This frog head was once part of a contortionist's costume. It's part of the collection donated to MIlner Library. Circus songsters featured music of the day performed under the big top. The librarians think this may be the fellow who wore the frog head. Stunning headdresses shown by Maureen Brunsdale. Costumes galore were part of the donation. An artist's rendering of a Tom Mix Circus poster. The Circus and Allied Arts Collection at ISU's Milner Library has hit the mother lode of sequined costumes, rare poster art, classic photos and a paper mache frog head in a donation of 250,000 items from the collection of a circus superfan. "It's thousands upon thousands upon thousands of things," explained a grinning Mark Schmitt, senior specialist in Special Collections at Milner Library. His equally dazzled colleague is Maureen Brunsdale, Special Collections librarian. "Herbert Ueckert is a lifelong circus fan," Brunsdale said of the generous donor. "And he's been collecting circus items for decades. He's a past president of Circus Fan Association of America. He's also a retired high school librarian from Las Vegas, but throughout his life, his real passion has been the circus." Ueckert resides in Sarasota, Florida, which is the home of the famous Ringling Museum. Yet, he chose to send his collection hundreds of miles north to ISU. 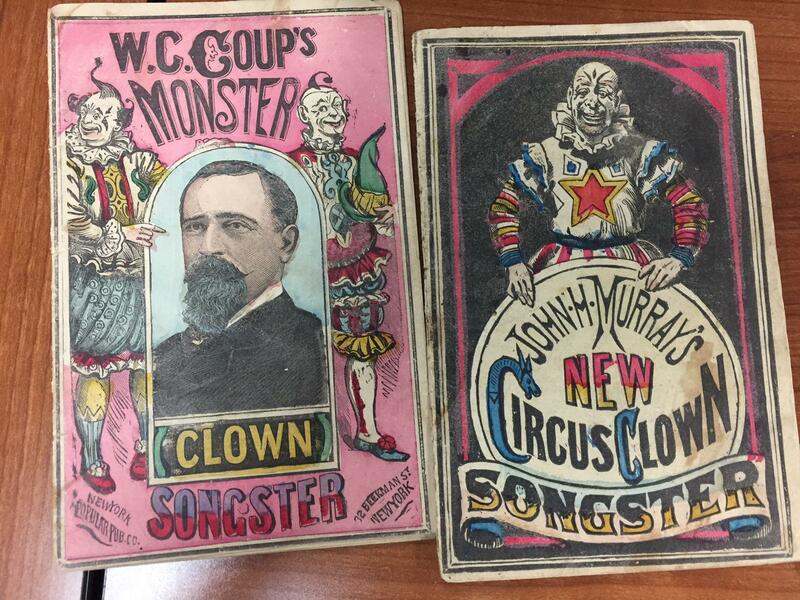 Brundale explained the reason Ueckert chose to donate to the original sketches of professional circus posters, candid and publicity photographs, clown props, performer’s costumes and more to Milner Library is because Ueckert appreciates the educational mission of ISU. "He sees the impact education has on students. This collection can be integrated into the curriculum so students can learn from it and in that way, bring circus back to life. I think that really resonated with him." The appeal of the new collection is cross-disciplinary, said Schmitt. "From geography, because circuses went around the world, family and consumer sciences with the genealogical and textile angle of the collection, and art, of course. We have so many beautiful lithograph posters that art students can benefit from studying them," he said. Business, marketing and music are other departments that can benefit from the unique archeology of this collection. The librarians are currently formulating a plan for an exhibition of some of the materials this coming spring. An excerpt from GLT's story about the circus donation. GLT's full story about the circus donation. Illinois State University is home to two unique and widely admired circus traditions -- Gamma Phi Circus, the 88-year strong circus arts program for students, and the Circus and Allied Arts Collection, part of the Special Collections at Milner Library. Both are keenly feeling the impending loss of The Greatest Show On Earth. Romances were often forbidden in the circus. Harry Potter was a famous trapeze artist. And circuses hated Texas. 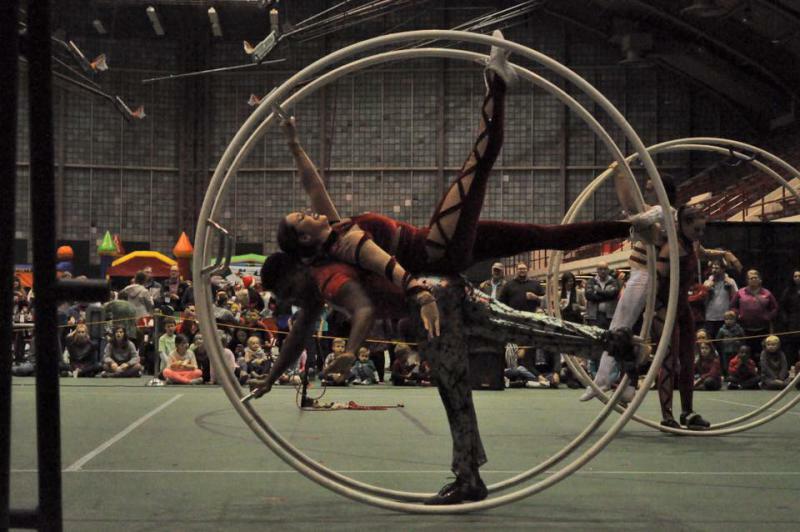 These are some of the tidbits of circus history you'll find in a route book.